The longest season of their baseball careers continues for several central Maine collegians who have hooked on with teams this summer. Franklin Pierce University junior and Hall-Dale graduate Ryan Leach joined the Chatham Anglers of the Cape Cod League a couple of weeks ago and has pitched three innings of relief in two games so far. Contributed photo by Robin Harper/Franklin Pierce Athletics Hall-Dale High School graduate Ryan Leach, a junior at Franklin Pierce University, is playing for the Chatham Anglers of the Cape Cod League this summer. 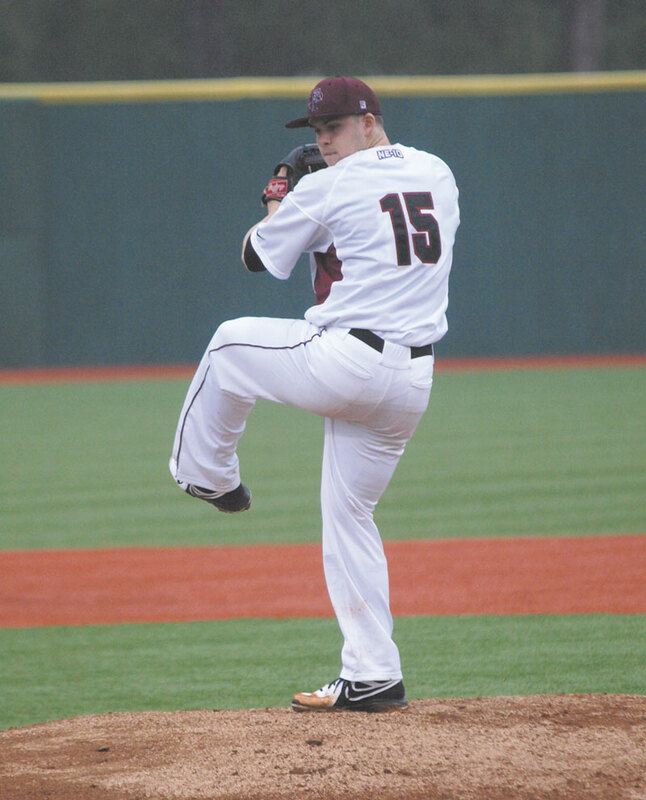 Leach fanned three and allowed one hit in a two-inning stint three days ago. He was used almost exclusively in relief for the Ravens this year, posting a 3.41 ERA while averaging nearly 11 strikeouts per nine innings. Franklin Pierce played 56 games this season and finished fifth in the Division II College World Series. “I’m going to shoot for the all-star team,” Leach said. The University of Southern Maine also played 56 games this season, finishing second in the Division III World Series. 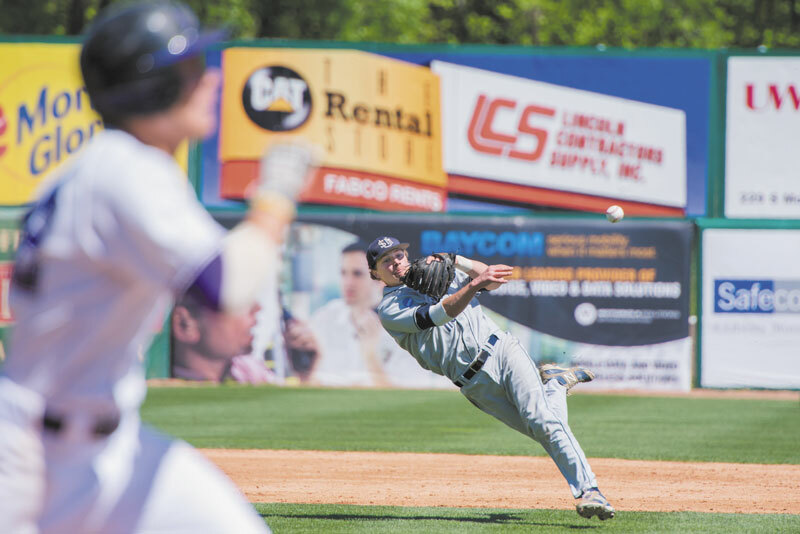 Gardiner Area High School graduate Forrest Chadwick drew the attention of major league scouts but when he didn’t get drafted, he returned to Mequan, Wis. to play for the Lakeshore Chinooks of the Northwoods League. A junior at USM this spring, Chadwick batted .380 with eight home runs and 44 RBIs. He was also a first-team all-conference and all-New England selection in the postseason. Teammate and Messalonskee graduate Sam Dexter enjoyed a banner year for the Huskies and is playing for the Mohawk Valley Diamond Dawgs of the Perfect Game Collegiate Baseball League in upstate New York. Dexter, who set a school record as a freshman for doubles (23) and assists (194) at USM, has started eight of nine games at shortstop for the Dawgs and is starting to hit. As Leach does, Dexter lives with a host family and spends a lot of his free time working out at the local YMCA. Games, he said, draw as many as 2,000 fans. “It’s much more intense than I thought it would be,” he said. Dexter still has a year of eligibility for his American Legion team and thinks he may be back in time for the playoffs. While many of his teammates are playing ball this summer, Nick Grady is considering major league tryouts and hoping to hook on with an independent team. The Erskine graduate finished his career at USM with a .395 batting average and 60 RBIs. His 96 hits were the most of any Division III player in the country and he was named ABCA/Rawlings and D3baseball.com first team All-American. Erskine grads and USM freshmen Shyler Scates and Ryan Pulver are playing in the Portland Twilight League. Scates, who pitched nine scoreless innings on Friday, expects to pitch once a week. Scates would like to get his fastball up to 86-87 mph by the time fall ball begins at USM. He pitched 50 innings for the Huskies with a 3.96 ERA. Messalonskee graduateand USM pitcher Nate Veilleux is also playing in the Twilight League this summer. Those too old for American Legion ball are hooking on with teams where they can. Waterville graduate and Husson University freshman J.T. Whitten is playing in a wooden bat league once a week while Erskine graduate and University of Maine at Farmington freshman Tom Grady is also playing in a men’s league.